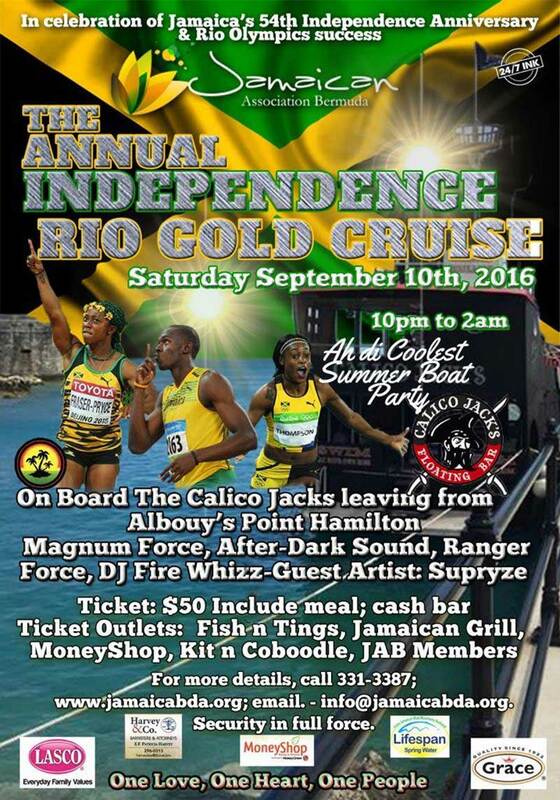 The Jamaican Association of Bermuda’s [JAB] annual Independence Cruise will take place tomorrow night [Sept 10] aboard the Calico Jacks following a rescheduling of the event due to inclement weather on August 26. A spokesperson said, “We invite everyone to come celebrate our 54th year of independence, as well as our historic achievements at the recently held Rio Olympics. The cruise will run until 2.00am, with a cash bar available and featuring Magnum Force, After-Dark Sound, Ranger Force, DJ Fire Whizz, and Supryze. For more information, call 331-3387, email info@jamaicabda.org, or visit the website.